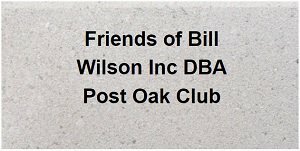 Post Oak Club is a private club housing the meetings of the Post Oak and First Light Groups of Alcoholics Anonymous. Founded in 1976, we now provide over 50 closed meetings a week for the Houston AA Community. From its humble beginnings at 1405 ½ Post Oak Drive, at a mere 550 sq ft, our home away from home has outgrown a number of buildings with our newest location boasting 5400 sq ft.
We still need your help in making the lifelong dream of a permanent home for A.A. meetings for generations to come a reality. Our common welfare should come first, and in this endeavor, much is needed in the way of updates and remodeling, as we bring our new building up to code. Your Memorial Brick pays homage to those who came before us, to share their experience, strength and hope, while helping us to guarantee the opportunity for those yet to find our way of life. Or, buy one for yourself and help us pave the way!